In business, it is critical to have a system of measuring key figures that drive your company’s growth. There is a myriad of ways to measure insights, but there are three main types of analytics: descriptive, predictive, and prescriptive. Let’s address the key differences and similarities between descriptive, predictive and prescriptive analytics. 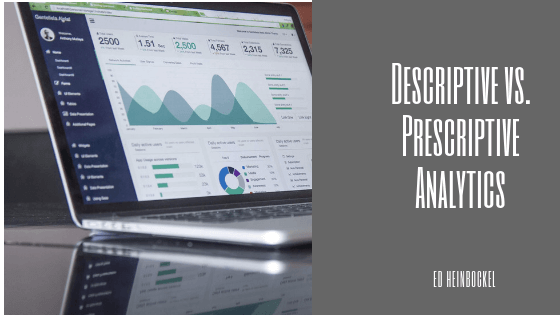 Descriptive analytics is becoming more and more prevalent in today’s society. Most people are familiar with platforms like Google Analytics and Facebook. These are all types of descriptive analytics. This type of data shows what has happened in the past. For example, when using Google Analytics, you will set a date range such as the past ninety days. From there you can see data and analytics on everything from how many views your website has received, how many people have engaged with you and even the length of time spent on the site. One of the most common examples of predictive analytics in practice is your credit score. The score you receive is formed using predictive analytics. It takes your history of credit and uses and predicts how you will behave financially in the upcoming years. For instance, if you have been late on your car payment ten out of twelve months in a year, predictive analytics will predict that the same will happen next year, and your credit score will be reflective of that. Prescriptive analytics takes predictive analytics one step further. Prescriptive analytics uses past behaviors from customers to predict their future actions. IBM coined the phrase “prescriptive analytics” in 2010 and since then it has been used by a myriad of other companies as artificial intelligence continues to grow. What is the difference between predictive and prescriptive analytics? While predictive analytics makes an educated guess at an end result, prescriptive analytics actually processes the descriptive numbers and presents a recommended set of options. Ed Heinbockel is the co-founder, President, and Chief Executive Officer of SavantX, Inc. Ed graduated from California Polytechnic State University-San Luis Obispo with a Bachelor of Science degree in Engineering and later with a Master’s in Business Administration. After graduating with his master’s degree, he began working with Sierra On-Line, Inc as CFO/ Controller. Mr. Heinbockel then went on to found Tsunami Media, Inc., and later Visual Purple LLC. In 2015, Ed and his wife, Lydia, started SavantX, Inc., a Wyoming-based company focused on utilizing novel Machine Learning approaches to solve real-world problems. Specifically, SavantX, Inc. has sought to assist the nuclear energy industry by significantly improving efficiency and safety through the use of Unsupervised Machine Learning and helping deliver on the Nuclear Promise.